I don’t think she knew what her words would set in motion. It was a sunny afternoon in the chaotic cluster that is an elementary art room. The dusty canvas mats had been rolled out, crusty clay smeared into the rough cloth. The foreboding amorphous hunk of clay sat in front of me as my classmates started in on their pinchpots. I knew what I was supposed to do. Press my thumb into the center of the glob and somehow mold it into a bowl, a perfect gift for a parent. A task easier said than done, to my seven year old self. Each attempt produced a sad looking lumpy and lopsided mess. Certainly not something I would care to wrap up and give to my mom as a Christmas gift. Our art teacher was a disheveled and zany lady, glasses perpetually pushed back in her unkempt hair and various pastel print dresses covered up by an paint-speckled apron; she gave the impression of being slightly frazzled and out of sorts at all times. Buzzing around the room refilling supplies and checking the creations of my classmates, she stopped at my seat and looked down at my lack of progress. “Allie, you just need to do it. It doesn’t have to be perfect. Come on!” she said impatiently before continuing to transfer crinkled art from the drying rack. I don’t remember how my pinch pot turned out. My art teacher never came over to console me or inspire me to dive into the risky creative process, but somehow I moved on. Art class became an intimidating thing for me in school, a series of elusive projects that I would have to “get right” or be exposed as a failure. I avoided taking art classes in high school as soon as it wasn’t required. And yet, as I got older, a love for creative expression took root in my soul. I got a sketchbook for Christmas one year, and in the safety of my own solitude, I started to sketch and paint. When it was just for me, without the pressure of being evaluated, I grew to love art again. Because I hadn’t pursued it in school, it never was something I considered as a career, but more and more it became a hobby. Slowly but surely, I found a voice in being able to create, whether it was in the written word, photography, or a collage of mixed media. Even though the calloused words of a scattered art teacher wounded me as a girl, her advice was solid. Allie, it doesn’t need to be perfect. You just need to do it. Dive in. The expectation of perfection inhibits us and stunts our ability to blossom into our real selves. It prevents authenticity: how can we risk the unedited expression of our soul if we are gripping tightly to who we think we are supposed to be, the way we perceive we are to supposed to perform? Brene Brown writes that “authenticity is the daily practice of letting go of who we think we’re supposed to be and embracing who we are.” I have found that to be so true, both as an artist and a human being. It’s the journey I want to be on every day of my life. So much of creating, as well as the simple act of living is about engaging fully in the moment– choosing to cast aside the need to “get it right” or to be perfect. Letting go and letting my unedited, un-selfconscious side take the reins. I love creating art that is a collage of different mediums, working together to form a mosaic of something that speaks the Truth in beauty. 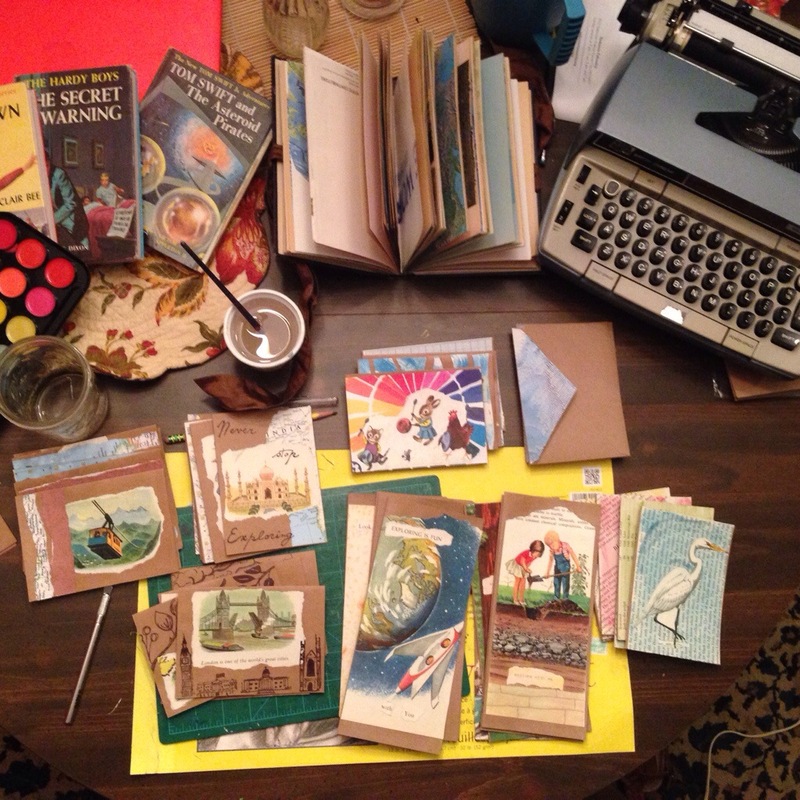 The art I’ve been creating this summer then becomes an avenue for others to do the same– through a journal or notecard. My Etsy Store, Jubiletsy has become a place to practice that authenticity, to do what I think my hands and heart were made to do, and to share that with others, as vulnerable and risky as that might be. Wren– thanks so much for sharing! We need more people in this world that are willing to empower with their words. What a beautiful thing to say– when you create art, it is a miracle. You inspired me right back, sister! Thanks for the compliment! That means so much to me 🙂 I’ve enjoyed reading your posts as well! Thanks so much! I appreciate your encouragement! You should check out Brene Brown’s book The Art of Imperfection. It’s inspired me so much!